Ryanair warned Tuesday that it may slash jobs and close some bases in Germany if it is hit with more strikes, a day before a work stoppage by pilots and cabin crew for better pay and conditions. The Irish no-frills airline has blasted the planned walkout as "unnecessary" and said it would be forced to cancel 150 out of 400 scheduled flights to and from Germany. "These threatened strikes can only damage Ryanair's business in Germany, and if they continue, will lead to base cuts and job cuts for both German pilots and cabin crew, particularly at some secondary German bases," the airline's Chief Marketing Officer Kenny Jacobs said. The spat is the latest escalation in Ryanair's battles with employees across Europe since it first started recognizing unions last year. Germany's Cockpit union and the Verdi services sector union have called for a 24-hour walkout from 3:00 am (0100 GMT) on Wednesday. The unions, representing some 400 Ryanair pilots and 1,000 crew, argue that no headway has been made with the airline's management despite repeated negotiations. Verdi warned that Wednesday's stoppage could be the first of several strikes, with board member Christine Behle saying: "This is a first warning strike. Anything further will depend on the process of the negotiations." But Ryanair hit back, saying it had already offered more local contracts and pay rises for pilots in Germany. "Ryanair is totally serious about working with unions," Jacobs told a press conference in Frankfurt. "It is unacceptable that a union representing Ryanair's German pilots, who earn up to 190,000 euros ($220,000) a year and work a five-day week followed by a four-day weekend, is now threatening customers travel plans at short notice," he added. The airline's Germany-based planes represents about one-tenth of its global fleet. Ryanair said it would try to minimize the disruption for customers, who will be offered free re-bookings. The airline last year averted widespread Christmas strikes by agreeing to recognize trade unions for the first time in its 33-year history, but it has since struggled to reach deals with the workers' representatives. Ryanair was hit by its first ever simultaneous pilot strike in five European countries last month, including in Germany. The walkout forced the airline to cancel 400 out of 2,400 scheduled flights during the peak summer holiday season. Italy, Portugal, Spain, Belgium, Germany, Sweden and the Netherlands are among the other countries where Ryanair pilots and cabin staff have taken strike action. More trouble is brewing with unions in Belgium, the Netherlands, Italy and Spain calling for another mass walkout in the last week of September. The unions have said it would be "the biggest strike action the company has ever seen". The famously low-budget airline boasts lower costs per passenger than its competitors and is eyeing profits of around 1.25 billion euros this year. But its staff has long complained that they earn less than counterparts at rival airlines. 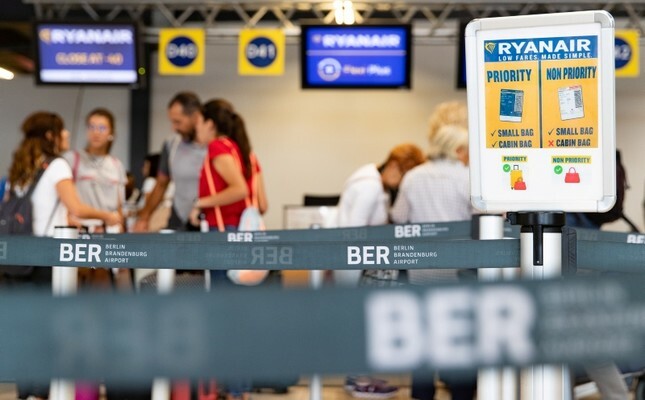 The Verdi union for instance says full-time cabin crew employees get a monthly gross salary of 800 to 1,200 euros from Ryanair that can be topped up depending on flying hours and seniority, but is still far below what rival EasyJet pays. Verdi has rejected Ryanair's offer of a 41-euro a month increase from 2020. Ryanair, which carries some 130 million passengers annually, has however made some progress in talks with unions in recent weeks. It reached a deal with Italian pilots union ANPAC over working conditions in late August, its first ever union agreement.